DIBELS Results Across 6 Consecutive Years. A publication of Voyager Learning (PDF). Read Well focuses on the same five core areas of reading instruction for English language learners (ELLs) recommended by researchers. Read Well is a research-based program with proven success in a diverse range of school districts across the nation. Click on the links on the right to see the phenomenal results of this mastery-based program. Lee County is a diverse district of 80,000 students (23% LEP, 7% SpEd, 55% Minority, 43% low SES). 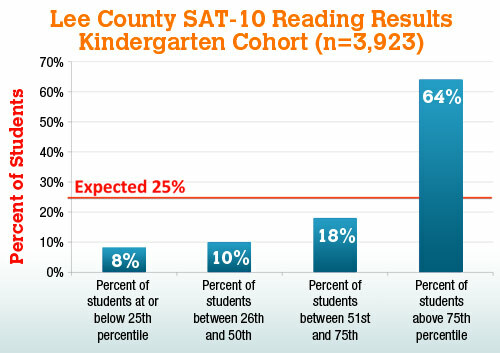 With Read Well as their core curriculum and intervention, Lee County's 4,000 kinders achieved the results shown below on the SAT-10 in 2009. Instead of the expected 25% of students falling between each quartile, an amazing 64% of students were at or above the 75% percentile. Only 8% scored at or below the 25% percentile on this norm-referenced test! Lee County staff and students achieved similar results on the SAT-10 in 2010, with a whopping 19% of students at or above the 99th percentile. "The instruction Lee County teachers provide through the Read Well kindergarten program has afforded our kindergarten children the opportunity to beat the bell curve! It is very gratifying to find 19 percent of our kindergarten students scoring at the 99th percentile on SAT-10, while only 8 percent are scoring below the 25th percentile."